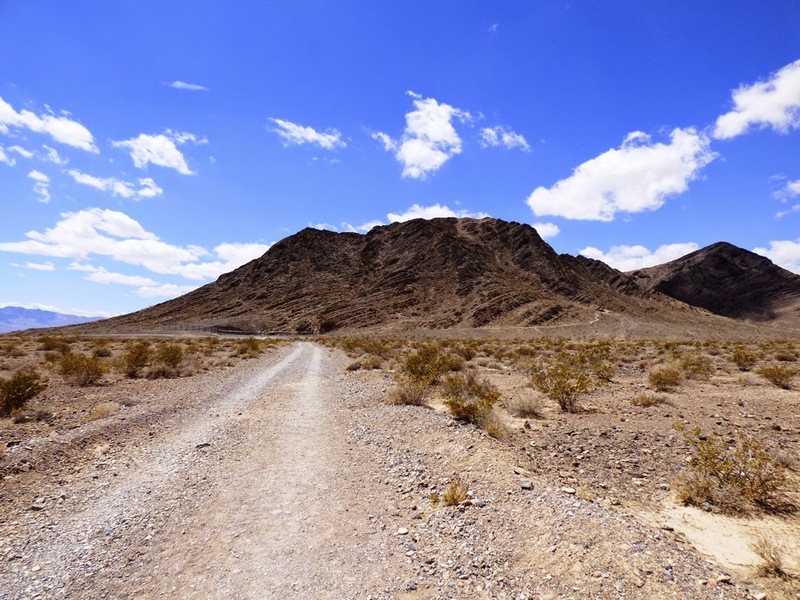 There is a lonely nondescript mountain of limestone in the barren desert east of Death Valley National Park. There is a hole at the base of the slope, the entrance to a cavern. 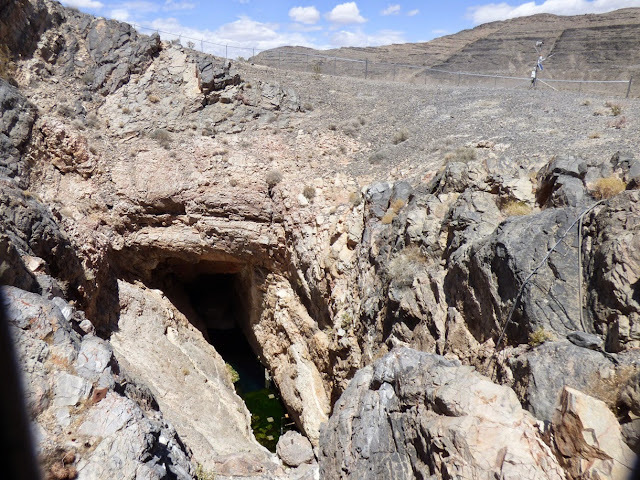 Lurking within are prisoners, creatures that have been trapped in the cave for perhaps 20,000 years or more. They are mutants, no longer the same as their cousins who live freely just a few miles away. They are alone in the world. That sounds kind of dramatic I suppose, but all of it is technically true. The story becomes a bit stranger when one realizes that the trapped creatures are fish. In one of the driest climates in North America. During the Ice Ages between 1.8 million and 10,000 years ago, glaciers in the Sierra Nevada were constantly melting in their lower reaches, and some of the resulting streams and rivers drained into the desert regions to the east. The faulted valleys would fill with water and spill over into the next so that at times an entire network of lakes and rivers existed. At some point a connection was made with the Colorado River system and fish worked their way into the widespread habitats. Dozens of species thrived in the freshwater lakes. But then conditions began to change. The climate grew warmer and the glaciers mostly melted away. One by one the lakes dried up as the rivers that once fed them turned to trickles and then disappeared. Most of the fish died out, but here and there springs or remnant lakes allowed some species to survive. The most isolated species of them all lives in this one hole, the Devil's Hole. 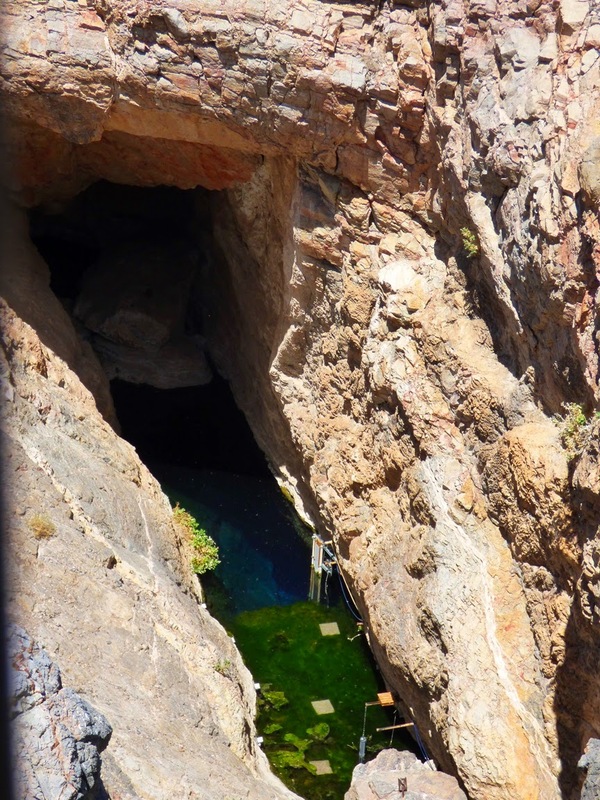 The Devil's Hole Pupfish (Cyprinodon diabolis) is in all likelihood the rarest fish in the world. There have never been more than five or six hundred of them, and their population has reached lows of only three dozen at times. They are living at the extremes, as the water is at a constant temperature of 93 degrees. Only a few other species of pupfish can survive those kinds of temperatures (you can read about some of the other species here: http://geotripper.blogspot.com/2015/02/you-think-some-fish-you-caught-was.html ). 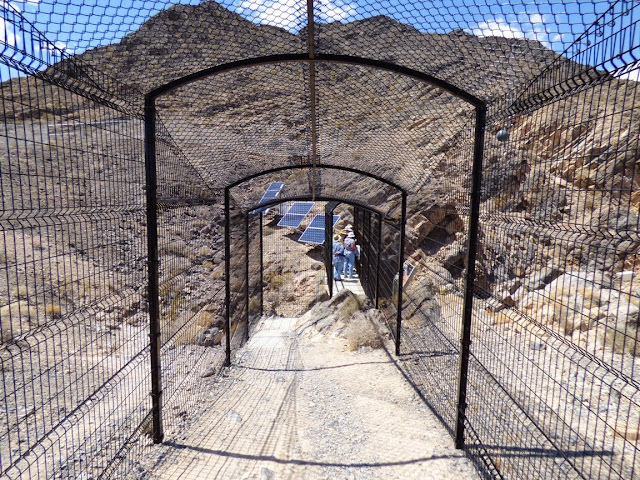 Their rarity explains the monitoring equipment and fencing that surrounds the cavern opening. The pool is visible from in side a caged tunnel, but the individual fish are a bit difficult to see. They're only an inch long, and the viewing platform is around a hundred feet away. I saw nothing on my previous visit five or six years ago, but this time I did. The efforts to protect the fish almost became their undoing when a 2004 flash flood dumped the monitoring platform and other debris into their pool. Something like a third of the population was lost. The platform was gone and there was a limited amount of equipment. And, there were three squares of what looked like white astroturf in the water. I don't know their purpose, but one idea is that they may protect eggs. Or maybe someone was making it possible to see the fish from so far away. 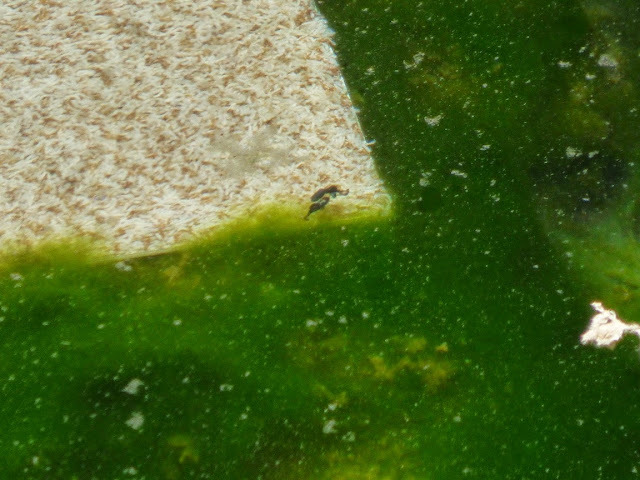 The fish feed from the algae covered bench on the near side of the pool. That bench was the crux of a Supreme Court decision in 1976 that prevented the extinction of the fish. At the time developers were digging deep industrial wells to promote the agricultural development of the adjacent valley, and the water level at Devils Hole began to drop. 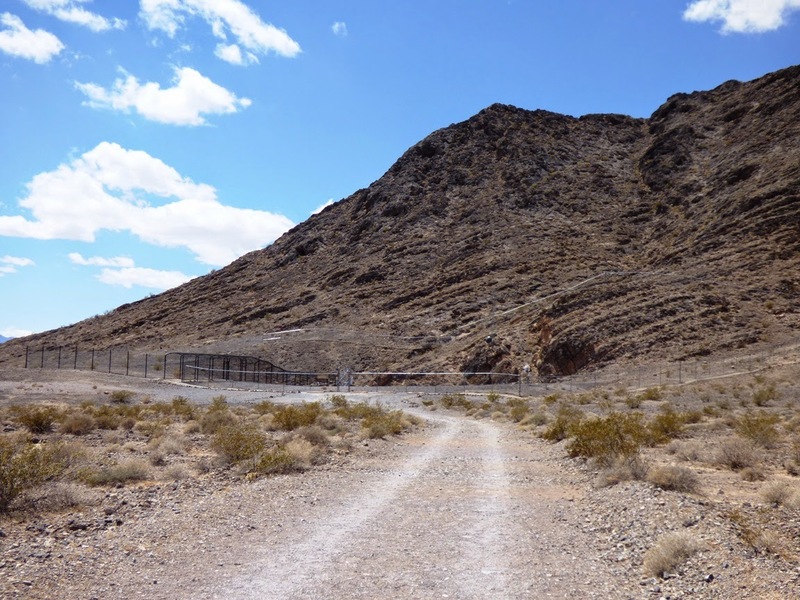 The court put a stop to the drilling, and the surrounding region became the Ash Meadows National Wildlife Refuge. It turns out to have been an astonishingly lucky turn of events, as the refuge has the largest concentration of endemic species in the continental United States (Hawaii is the only state with more endemic species). 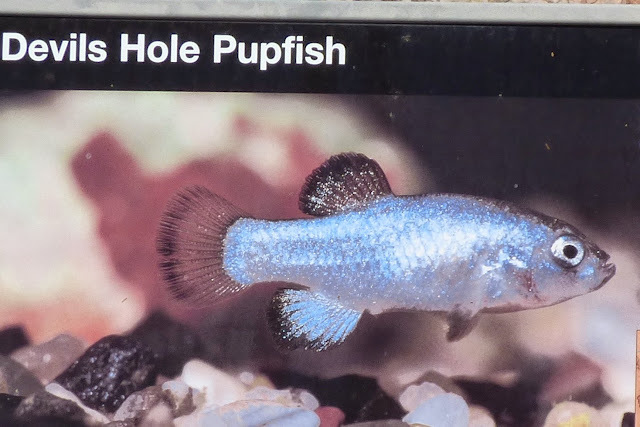 In any case, I got to see the Devils Hole Pupfish, the rarest fish on the planet, for the first time ever. Thank goodness for a good zoom lens (bring binoculars or a good camera if you ever visit). 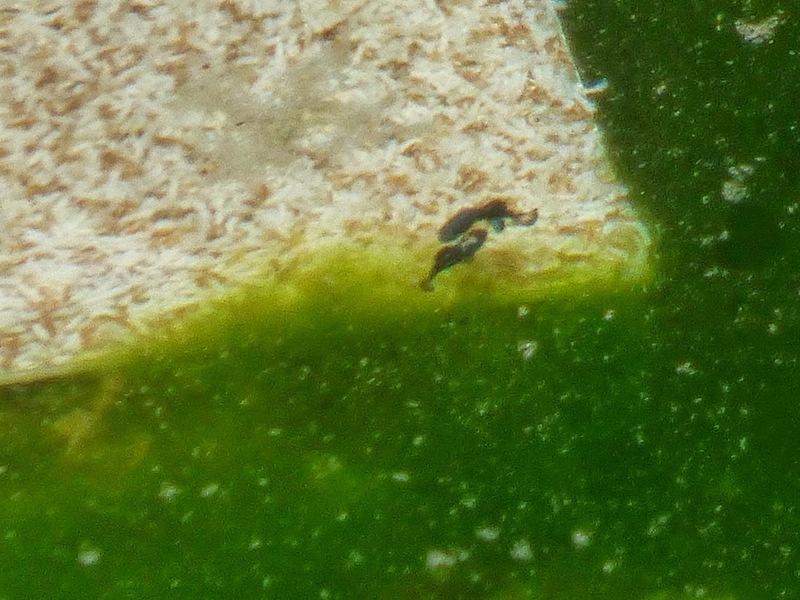 The squares are only a foot or so across, but one could make out the shapes of the fish as they swam over the light colored material. So here is the cropped and enlarged version of the image above, which doesn't show much, but remember I was more than 100 feet away. I even managed to get a very short video of the fish (all of 8 seconds or so). It's not every day that one can see the rarest of anything. If you ever find yourself in the Death Valley region, don't pass up the opportunity to see these fascinating creatures. They could be extinct any day despite our incredible efforts.